Contemporary art is incredibly obsessed with ideas, and with the idea of ideas — when you read the exhibition blurb, it’s always full of stuff about the conceptual background to the work, and the ideas the work is supposed to provoke in the viewer. I don’t have a principled objection to art based on ideas — a lot of it is crap, that’s Sturgeon’s Law for you — but it’s slightly odd, really, that it has become such an apparently essential element of art. Art is fundamentally tied to the physical reality of made objects*, and to suggest that those tangible objects are not enough to justify themselves, that they need to be dressed up in abstract ideas, almost seems to show a lack of confidence. As well as sometimes having a whiff of Emperor’s new clothes about it. 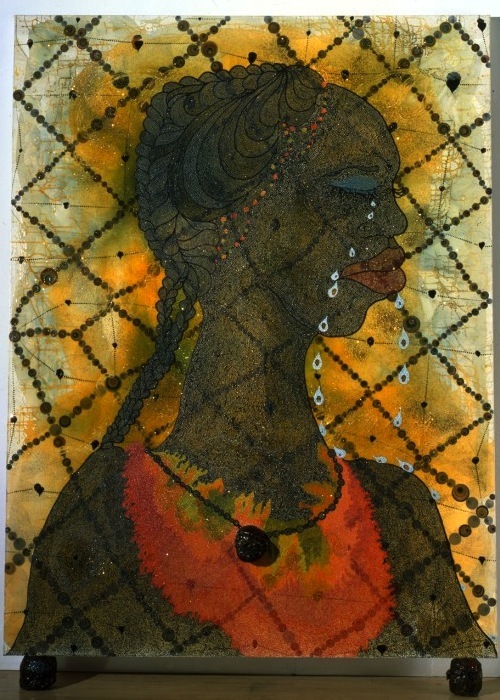 Chris Ofili can certainly do ideas with the best of them — his work engages in various interesting ways with blackness, Africa, religion, the canon and so on — but those ideas are expressed via exciting, beautiful objects. They have colour and texture, they are attractive at a distance but have fascinating fine details that draw the eye. Big paintings, leaning on the wall supported by varnished lumps of elephant dung, the way they are displayed emphasises their physical presence. No Woman, No Cry is a tribute to the London teenager Stephen Lawrence. The Metropolitan police investigation into his racially motivated murder was mishandled, and a subsequent inquiry described the police force as institutionally racist. In each of the tears shed by the woman in the painting is a collaged image of Stephen Lawrence’s face, while the words ‘R.I.P. Stephen Lawrence’ are just discernible beneath the layers of paint. But it doesn’t need that context to work: in 200 years time, when the name of Stephen Lawrence is a historical footnote, it will still be a beautiful painting. * yeah, I know, it’s more complicated than that.